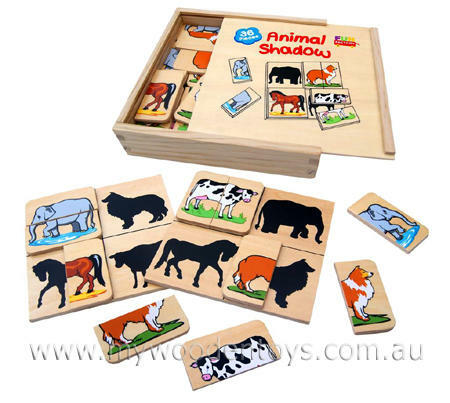 Wooden Animal Shadow Puzzle is a very well thought through animal matching game. The puzzle has 36 pieces made up of 32 small coloured pieces and 4 boards with four shadows painted onto each of them. The game is to match the 16 different animals to the correct shadows. This is a fantastic challenge and there are many learning possibilities for naming, sorting and matching. This game comes in a sturdy wooden box with a sliding wooden lid. Size: 20 x 20 x 5.5cm. We like this because: "Brilliant educational toy filled with fun learning possibilities."